On March 1, 2013, the State Department issued a draft supplemental environmental impact statement (EIS) evaluating TransCanada’s Keystone XL pipeline. The final EIS is one of the pieces the president will consider in determining whether the pipeline is in the national interest. To quote the executive summary of the statement, the national interest determination “involves consideration of many factors, including energy security; environmental, cultural, and economic impacts; foreign policy; and compliance with relevant federal regulations.” (page 6). Fortunately, the EIS is not the only thing that the president will consider in making the determination. Until April 22, the State Department is accepting public comments on the pipeline, and you can submit yours through 350MA and 350.org. The State Department’s draft EIS discounts the degree to which Keystone XL would contribute to further development of the Alberta tar sands. In addition, it largely dismisses the effects of the greenhouse gas emissions produced through the burning of tar sands. Yet despite these inadequacies, a closer reading of the EIS reveals compelling evidence that the pipeline is not in our national interest. Proponents of the pipeline like to argue that because tar sands oil comes from our friendly Canadian neighbors, it will furnish the United States with a stable source of fossil fuel. This is a gross distortion—the United States would assume all the risk of having the tar sands oil course through the heart of our country, with little guaranteed security at the other end. Keystone XL would carry tar sands oil to refineries in the Texas Gulf Coast region. But as the EIS notes, from the refineries, the oil would be subject to the vagaries of the world market. TransCanada executives will make sure it’s sold to the highest bidder, and according to the EIS, that is less and less likely to be the United States: “While the increase in U.S. production of crude oil and the reduced U.S. demand for transportation fuels will likely reduce the demand for total U.S. crude oil imports, it is unlikely to reduce demand for heavy sour crude at Gulf Coast refineries” (section 1.4, page 1). This means that as demand for fuel from the United States decreases, demand from other countries is keeping the refineries busy. Section 1.4 of the EIS also notes that although it is unlikely that tar sands oil would be shipped from the Gulf Coast for refining outside of the United States, the only thing preventing that possibility is the lower cost of refining in the Gulf Coast region. Should market conditions change, TransCanada would be free to ship the unrefined tar sands oil overseas, making the United States nothing more than a bridge from one point to another—a bridge bearing all the risks of pipeline leaks and spills. One of the most flagrant flaws in the State Department’s EIS is the report’s refusal to consider the impacts of the greenhouse gases that would be generated during the operation of the pipeline and from the burning of the tar sands as refined fossil fuels. Well, that’s not quite accurate. The EIS notes that operating the pipeline would generate approximately 3.19 million metric tons of greenhouse gas emissions per year, mostly from running the electrical pumping stations along the pipeline route: “The annual CO2e emissions from [operating] the proposed Project is equivalent to CO2e emissions from approximately 626,000 passenger vehicles operating for one year or 398,000 homes using electricity for one year” (executive summary, page 17). To mitigate the greenhouse gas emissions generated by the operation of the pipeline, the EIS suggests that operators “Consider the purchase of green electricity from the grid” (section 4.12, page 20). Apparently, the EIS authors are oblivious to the irony of suggesting that we use green electricity to support the further development of fossil fuels. The executive summary notes that the oils from tar sands “are more [greenhouse gas]-intensive than the other heavy crudes they would replace or displace in U.S. refineries, and emit an estimated 17 percent more [greenhouse gases] on a life-cycle basis than the average barrel of crude oil refined in the United States in 2005” (page 17). Scientist and climate activist James Hansen is more explicit in his evaluation of the development of the tar sands—he has said that development of the tar sands is “essentially game over” for the climate. The EIS dismisses such concerns because it concludes that tar sands will be developed regardless of whether Keystone XL is approved. But as the actions of climate activists around the world and here in the United States have shown, opposition to our continued dependence on fossil fuels is growing. If we can stop the Keystone XL pipeline, who’s to say we can’t stop (or delay or limit) the development of Canada’s tar sands? When it comes to iconic American images, few are etched on our national memory as profoundly as the sweep of prairie and ranchers moving their herds across the land. But the pipeline will cut through the heart of cattle country in Nebraska and Montana, and many ranchers are fearful of the consequences. I am a Nebraska cattleman and landowner. I am fighting against the [Keystone XL] pipeline for two very basic reasons. First of all, I feel very strongly that this pipeline represents an assault on the individual property rights of American citizens. There is something inherently wrong about the idea of American landowners being forced to subsidize the private enterprise of a foreign corporation with land that their families have earned through generations of hard work and determination. Secondly, I feel that the [Keystone XL pipeline] presents a real threat to some of our nation’s most valuable natural resources, especially our rivers, streams and underground aquifers. These are priceless American assets that no amount of oil money, foreign or otherwise, could ever replace. And ranchers are not the only ones whose land could be seized for the construction of the pipeline. Native American peoples, gathered largely under the banner of Canadian-American coalition Idle No More, are likewise protesting Keystone XL—for its encroachment on their lands as well as the broader environmental consequences of moving forward with the pipeline. Pipeline developers would like to convince Americans that Keystone XL holds the key to jobs and prosperity, but the truth is that the money will flow in only one direction—to the executives at TransCanada. According to pages 15 and 16 of the executive summary, construction of the pipeline will generate approximately 42,100 annual jobs for one to two years (3900 jobs directly related to construction). This employment would result in approximately $2.05 billion in earnings. States that levy sales and use taxes could collect about $65 million each during construction. After that point, the operation of the pipeline would generate 35 permanent jobs and 15 temporary jobs. Although $2.05 billion might seem promising, consider that in 2011, oil companies made a profit of $80 billion. In addition, fossil fuel companies manage to net billions of dollars in tax subsidies each year. And consider that the state of Nebraska had approximately $4.2 billion in tax revenue in 2012. That $65 million suddenly seems pretty paltry. But of course, the worst exaggeration relates to the jobs. After the pipeline is complete, 50 jobs (15 of them still considered “temporary”) will remain. One could argue that long-term indirect employment from the pipeline would be greater—refineries, for example, might have to hire more workers to increase capacity—but those numbers will surely not be enough to nudge down the country’s overall unemployment rate. March was a slow month for job growth, and the U.S. economy still managed to add 88,000 jobs. TransCanada and pipeline supporters argue that Keystone XL holds the promise of jobs and revenue, but it is a false promise, belied by the details of the State Department’s own report. In addition to misrepresenting Keystone XL as the key to a stable and secure source of energy for the United States, TransCanada and the Canadian government have presented the development of the tar sands as an unmitigated boon to the economy of Canada, and one that has the widespread support of Canadian citizens. But in reality, many Canadians share the same worries and doubts about tar sands developments as we do. Proponents of Keystone XL want Americans to believe that rejection of the pipeline would jeopardize our relationship with Canada. But again, closer inspection of the facts shows that Canadians themselves are questioning the wisdom of tar sands developments. The only friendly relationship we’d be sure to preserve by going ahead with Keystone XL is our relationship with TransCanada. The EIS itself fulfills the requirements for evaluation put forth by the National Environmental Policy Act (NEPA). However, as first reported in Mother Jones, several scientists working for Environmental Resources Management (ERM), the contractor commissioned to draft much of the EIS, have previous ties to TransCanada and other oil companies. When federal regulations allow for such conflicts of interest—conflicts that did not have to be revealed on ERM’s conflicts of interest disclosure—the relevance and effectiveness of regulations such as NEPA seems questionable. Furthermore, as incidents with existing pipelines have shown, federal regulations are largely ineffective when it comes to preventing leaks and spills or lessening their effects. Spills in Arkansas and Utah are only the most recent. Scientific American asserts that there are hundreds of small leaks in oil pipelines each year. And even new pipelines can leak. Keystone I, a piece of the Keystone Pipeline System that is already built and in use, has suffered 14 leaks since 2010. 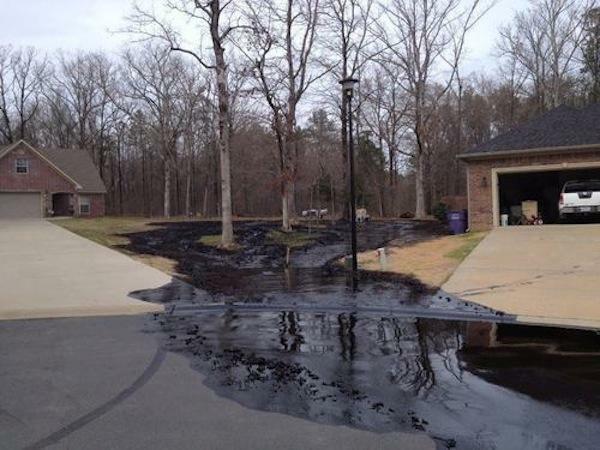 As thousands of gallons of crude oil ooze down suburban streets, it’s difficult to imagine that federal regulations, or fines for failures after the fact, could ever be adequate to the task of protecting our aquifers, rivers, lakes, land, and property. Until April 22, 2013, the State Department will be accepting public comments on the draft EIS and the proposed Keystone XL pipeline. Please take a few minutes to submit your comments through 350MA or 350.org. You can also email the State Department directly at keystonecomments@state.gov or call Genevieve Walker at 202-647-9798. Tell the State Department and the President that there is no way Keystone XL is in our national interest. If we let tar sands oil come to market through the United States, we have everything to lose—and only TransCanada gains. Previous Article Spring is Here: Raise Your Voice! Next Article We support the Building Energy Reporting and Disclosure Ordinance!